Col du Grand Colombier (el. 1,501 metres or 4,925 feet) is a mountain pass in the Jura mountains in France. This pass lies at the southern extremity of the Jura in the massif of the Grand Colombier. With the Col du Chasseral, it is the highest road pass in the Jura. It passes between the Grand Colombier (el. 1,531 metres or 5,023 feet) and the Croix du Colombier (1,525 metres or 5,003 feet), which is accessible by trail from the pass. The view from the summit is superb, either down the valley of the Rhône, the Lac du Bourget and the gorges of Val-de-Fier, or the distant peaks of the Alps. It is one of the most difficult passes in France, with stretches in excess of 20% on the climb from Artemare via Virieu-le-Petit on the Bugey (western) side. The pass has seen frequent use in cycling, being a regular feature of the Tour de l'Ain and also used in the Critérium du Dauphiné and Tour de l'Avenir. From Culoz (south), the ascent is 18.3 km. long gaining 1,255 m. in height at an average percentage of 6.9%, but with some sections at 12%. This climb is the direction used on Stage 5 of the 2012 Critérium du Dauphiné and Stage 10 of the 2012 Tour de France. The Col can also be reached from Anglefort (east), from where it is 15.2 km. long climbing 1,205 m. at an average of 7.9%. It was visited by the Tour de France for the first time on Stage 10 of the 2012 tour as a Hors Catégorie climb. The leader over the summit was Thomas Voeckler, who went on to take the stage victory in Bellegarde-sur-Valserine. ↑ "Col du Grand Colombier: Artemare". www.climbbybike.com. Retrieved 3 July 2012. ↑ "Col du Grand Colombier: Culoz". www.climbbybike.com. Retrieved 3 July 2012. 1 2 "Mountain passes & Hills: Stage 10". Tour de France. Amaury Sport Organisation. Retrieved 3 July 2012. ↑ Atkins, Ben (8 June 2012). "Arthur Vichot takes his biggest ever victory in breakaway stage five". VeloNation. VeloNation LLC. Retrieved 3 July 2012. ↑ "Col du Grand Colombier: Anglefort". www.climbbybike.com. Retrieved 3 July 2012. ↑ "STAGE 10: Mâcon – Bellegarde-sur-Valserine". Stage by stage. Tour de France 2012. Retrieved 31 May 2012. ↑ Cossins, Peter (11 July 2012). "Voeckler wins from breakaway in Bellegarde-sur-Valserine". Cycling News. Future Publishing Limited. Retrieved 11 July 2012. 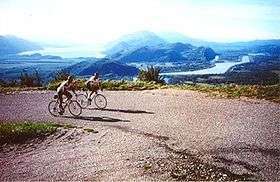 Wikimedia Commons has media related to Col du Grand Colombier.